Greek government officials are insisting that a deal with the country's international lenders over reforms is imminent, but one key business leader told CNBC that Greece needs to implement reforms fast, whether a deal is on the cards or not. "Greece is in a liquidity trap. We need to rectify the situation and agree on certain issues," Costantine Michalos, president of the Union of Hellenic Chambers of Commerce & Industry, told CNBC Tuesday. "You don't need an agreement with your lenders and partners to improve your tax collecting mechanism, you don't need an agreement to improve your labor laws based on European norms on flexibility, and you don't need an agreement in order to proceed with privatizations," he added. It comes as Greece's Labour Minister, Panos Skourletis, added his voice to that of the prime minister and finance minister, insisting that a deal with creditors was imminent "in the coming days," Reuters reported Tuesday. Greece has been negotiating with creditors for months over reforms that -- when implemented -- could unlock a last tranche of much-needed bailout aid, worth 7.2 billion euros ($8.14 billion). Sticking points in the talks have ranged from labor market and pension reforms to disputes over the privatization of Greek state assets, although Greece has made some concessions on the latter point. Greek Prime Minister, Alexis Tsipras, on Monday ruled out further pension cuts, but said a list of proposals for an overhaul of the nation's VAT (sales tax) regime had been sent to lenders and he claimed a deal was imminent. Speaking at a meeting of the Greek Industrial Federation Monday, Tsipras said Greece had tabled proposals for a "viable deal with creditors" and that the country was "in the final straight for an agreement." The remarks were echoed by the country's Finance Minister, Yanis Varoufakis, who added that Greece was near a cash-for-reforms deal with its euro zone partners and the International Monetary Fund (IMF) that would help it meet debt repayments next month. "I think we are very close (to a deal) ... let's say in a week," Varoufakis told Greek TV channel, Star TV. "Another currency is not on our radar, not in our thoughts." He also suggested that Europe's bailout fund pay back the country's maturing bonds held by the European Central Bank (ECB), and that Greece could pay it back at a later date. There are also growing concerns that Greece could be facing bankruptcy, amid a risk of a default on debts to international creditors, with deadlines looming for repayments to the ECB and IMF next month. European policy makers are losing patience with Tsipras who said as recently as May 14 that he won’t compromise on any of his key demands. He’s planning to force a discussion of Greece at a summit of European Union leaders in Latvia that begins on May 21, a day after the European Central Bank’s Governing Council meets in Frankfurt. Greek bonds tumbled on Monday, pushing 10-year yields up by the most since January. Yields on two-year Greek notes jumped 352 basis points to 24.44 percent. Greek bonds remain the best-performing sovereign securities over the past month, according to Bloomberg’s World Bond Indexes. The Athens Stock Exchange rose 1.6 percent, following a report that the European Commission is trying to broker a compromise deal. An EU Commission spokeswoman said she wasn’t aware of such a proposal. While talks are centering on whether to give Greece more money, the ECB could decide to raise the stakes as soon as this week if it increases the discount on the collateral Greek banks pledge in exchange for cash under its Emergency Liquidity Assistance program. Such a move might inadvertently prompt a further outflow of bank deposits and pressure Tsipras to choose between doing a deal and putting his country on the road to capital controls. A Greek government spokesman declined to comment, as did officials at the Greek central bank and the ECB. The arithmetic goes as follows: Greek lenders have so far needed about 80 billion euros ($91 billion) under the ELA program. Banks have enough collateral to stretch that lifeline to about 95 billion euros under the terms currently allowed by the ECB, a person familiar with the matter said. With the central bank raising the ELA by about 2 billion euros every week, that could take banks to the end of June. A crunch will come if the ECB increases the haircut on Greek collateral to levels not seen since last year. That could be prompted by anything from a complete breakdown in talks to a missed debt payment, the official said. A continuation of the current impasse could even be all that’s needed, the official said. An increased haircut would reduce the ELA limit to about 88 billion euros, the person said. While that gives banks about four weeks before hitting the buffers, the leeway is so limited that Greece might need to impose capital controls, limiting transactions such as ATM withdrawals, to conserve the cushion. Market News International first reported on the reduced ceiling on May 12. “Since the great crisis of 2008, Europe has created many tools to control the flow of money and banks,” said Andreas Koutras, an analyst at In Touch Capital Markets in London. 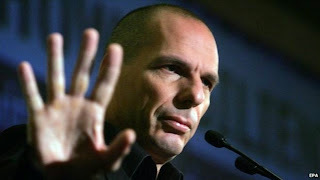 “Thus the crisis in Greece is more likely to be resolved through the tools of the ECB rather than” by political means. Investors in Greek debt are showing few signs of panic for now, with the yield on the Greek 10-year bond still having dropped about 2.2 percentage points lower than its two-year high of 13.64 percent on April 21. Nor are ECB policy makers willing to raise the pressure on Greek banks on their own. Central bank governors won’t take any action which would be seen as pushing Greece out of the currency bloc if negotiations show progress and convergence, the person said. Greek lenders are also working with the country’s central bank on plans to collateralize additional assets, a separate local official with knowledge of the matter said. Still, it’s unclear if these assets, including government guarantees, would be accepted by the ECB if the standoff in bailout negotiations persists. According to a senior Greek commercial banker, the ECB’s decision on what to accept as collateral is essentially a judgment call, and not necessarily related to the quantity of the assets available. “The Greek government at this point has no room for maneuver,” Spanish Economy Minister Luis de Guindos said in a speech in Madrid on Monday. He said he was still optimistic a deal will be reached in the coming days. “This deal is essential for Greece given its liquidity situation,” he said. Tsipras will push Greece’s case at this week’s EU leaders’ summit in Riga after a weekend that showed few signs of progress. An International Monetary Fund memo dated May 14 said Greece won’t be able to make an IMF payment on June 5 unless an accord is reached with partners, the U.K’s Channel 4 news reported on Saturday. The ECB’s next full monetary policy meeting is on June 3, two days before the IMF payment. Once again, Greece seems to have slipped the financial noose. By drawing on its holdings in an International Monetary Fund reserve account, it was able to repay €750 million ($851 million) – ironically to the IMF itself – just as the payment was falling due. This brinkmanship is no accident. Since coming to power in January, the Greek government, led by Prime Minister Alexis Tsipras’s Syriza party, has believed that the threat of default – and thus of a financial crisis that might break up the euro – provides negotiating leverage to offset Greece’s lack of economic and political power. Months later, Tsipras and his finance minister, Yanis Varoufakis, an academic expert in game theory, still seem committed to this view, despite the lack of any evidence to support it. But their calculation is based on a false premise. Tsipras and Varoufakis assume that a default would force Europe to choose between just two alternatives: expel Greece from the eurozone or offer it unconditional debt relief. But the European authorities have a third option in the event of a Greek default. Instead of forcing a “Grexit,” the EU could trap Greece inside the eurozone and starve it of money, then simply sit back and watch the Tsipras government’s domestic political support collapse. Such a siege strategy – waiting for Greece to run out of the money it needs to maintain the normal functions of government – now looks like the EU’s most promising technique to break Greek resistance. It is likely to work because the Greek government finds it increasingly difficult to scrape together enough money to pay wages and pensions at the end of each month. To do so, Varoufakis has been resorting to increasingly desperate measures, such as seizing the cash in municipal and hospital bank accounts. The implication is that tax collections have been so badly hit by the economic chaos since January’s election that government revenues are no longer sufficient to cover day-to-day costs. If this is true – nobody can say for sure because of the unreliability of Greek financial statistics (another of the EU authorities’ complaints) – the Greek government’s negotiating strategy is doomed. The Tsipras-Varoufakis strategy assumed that Greece could credibly threaten to default, because the government, if forced to follow through, would still have more than enough money to pay for wages, pensions, and public services. That was a reasonable assumption back in January. The government had budgeted for a large primary surplus (which excludes interest payments), which was projected at 4% of GDP. If Greece had defaulted in January, this primary surplus could (in theory) have been redirected from interest payments to finance the higher wages, pensions, and public spending that Syriza had promised in its election campaign. Given this possibility, Varoufakis may have believed that he was making other EU finance ministers a generous offer by proposing to cut the primary surplus from 4% to 1% of GDP, rather than all the way to zero. If the EU refused, his implied threat was simply to stop paying interest and make the entire primary surplus available for extra public spending. But what if the primary surplus – the Greek government’s trump card in its confrontational negotiating strategy – has now disappeared? In that case, the threat of default is no longer credible. With the primary surplus gone, a default would no longer permit Tsipras to fulfill Syriza’s campaign promises; on the contrary, it would imply even bigger cutbacks in wages, pensions, and public spending than the “troika” – the European Commission, the European Central Bank, and the IMF – is now demanding. For the EU authorities, by contrast, a Greek default would now be much less problematic than previously assumed. They no longer need to deter a default by threatening Greece with expulsion from the euro. Instead, the EU can now rely on the Greek government itself to punish its people by failing to pay wages and pensions and honor bank guarantees. Tsipras and Varoufakis should have seen this coming, because the same thing happened two years ago, when Cyprus, in the throes of a banking crisis, attempted to defy the EU. The Cyprus experience suggests that, with the credibility of the government’s default threat in tatters, the EU is likely to force Greece to stay in the euro and put it through an American-style municipal bankruptcy, like that of Detroit. The legal and political mechanisms for treating Greece like a municipal bankruptcy are clear. The European treaties state unequivocally that euro membership is irreversible unless a country decides to exit not just from the single currency but from the entire EU. That is also the political message that EU governments want to instill in their own citizens and financial investors. If Greece defaults, the EU will be legally justified and politically motivated to insist that the euro remains its only legal tender. Even if the Greek government decides to pay wages and pensions by printing its own IOUs or “new drachmas,” the European Court of Justice will rule that all domestic debts and bank deposits must be repaid in euros. That, in turn, will force a default against Greek citizens, as well as foreign creditors, because the government will be unable to honor the euro value of insured deposits in Greek banks. So a Greek default within the euro, far from allowing Syriza to honor its election promises, would inflict even greater austerity on Greek voters than they endured under the troika program. At that point, the government’s collapse would become inevitable. Instead of Greece exiting the eurozone, Syriza would exit the Greek government. As soon as Tsipras realizes that the rules of the game between Greece and Europe have changed, his capitulation will be just a matter of time. Andreas Koutras shared this with me: "Can someone say to Anatole that lack rationality and logic is exactly why Greece is in the current position. He is applying the wrong tool for the situation. Many have made this mistake including myself." I'm not going to get into the strengths and weaknesses of Kaletsky's arguments but he makes one valid point, Syriza will be much weaker if it decides to default and it will implode. Also, as I explained in my last comment on a new deal for Greece, Grexit and return to the drachma will bring about much more pain and devastation to Greece than the mindless austerity troika imposed on the country. Interestingly, the Globe and Mail reports on a mysterious spike in the shares of a small Canadian pulp and paper stock is rumored to foretell an exit of Greece from the eurozone. I strongly doubt that Grexit is going to happen, at least not this summer. With Greek tourism season set to commence, it's not in anyone's best interest to have a crisis now. But the endgame is near and I think Syriza will blink and disenchanted Greeks will realize there is no easy solution to the country's economic woes. Below, a Bloomberg discussion on whether Greece’s endgame includes a referendum. And Costantine Michalos, president of the Union of Hellenic Chambers of Commerce & Industry, tells CNBC that "Greece is in a liquidity trap and we need to rectify the situation and agree on certain issues."